I have been sketching and painting like mad this week. Not only naked people as you can see above. 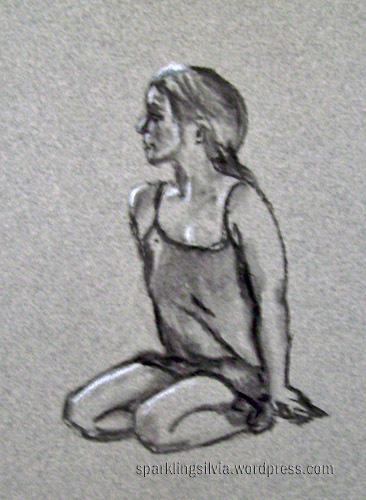 This drawing is a 15 minutes pose by the way, and it has been drawn with white and black charcoal on canson paper. No, your monitor doesn’t play any tricks on you, the paper really has this strange texture, yet it looks lovelier in reality than on the screen. Throughout this week I learned quite a few things. Second, that I can draw a decent sketch of almost every person in almost every position from life(!) in less than 20 minutes. That’s a big improvement! Last, that charcoal loves ingres and canson paper! Really! I always disliked these kinds of papers, because of their rough structure that would always come through in each and every colored pencil drawing, but it’s a completely different thing with charcoal! It just glides so smoothly over the surface of those two kinds of papers… it’s unbelievable :)! … and keeps me busy. I thought that I could easily sketch something food on the fly, too, but I’m feeling horribly exhausted after 7 hours of sketching and painting. … and I noticed with horror, that I’ll be taking two weeks of life class course in the summer holidays (= next month) and I haven’t practiced drawing from life in a while. Actually, I haven’t ever drawn humans from life at all. Only from photographs, and it’s just so much nicer with a photo …they don’t move, the angles and shadows stay the same… and in case you fail completely no one will get to see this mess!!! Before I start to panic, I should rather try and practice a little bit the next days :). 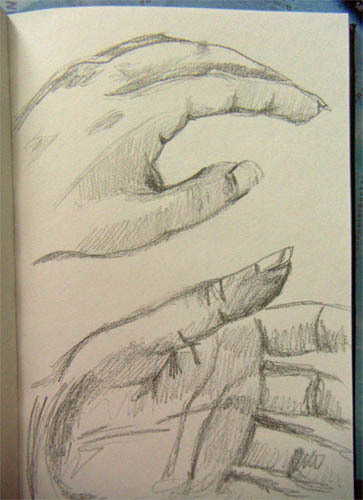 Just started with some hand drawings to warm up. My first fav. medium had been soft pastels (aka “dusties“). They were so bright, so wunderful easy to apply, they blended well —- but then I had to realize that they just wouldn’t like to remain on the paper, in fact they seemed more attracted to my carpet. I tried fixing them, but didn’t like it since the fixative sprays tends to darken the colors. So I sold my complete set on ebay. I am collecting fountain pens. At least that’s the only explanation why I do own more than 50 of these writing instruments. I’ve started drawing and painting more regularly only 14 months ago. It has been an amazing experience for me to see how fast my painting skills have improved in this short period of time and I am very curious to see where I’ll be in one year from now 🙂 ). My natural hair color is red, but I prefer to wear it dyed brunet at the moment. Now it’s my turn to tag 5 others, but since I don’t like being tagged I’ll leave this one up to you my dear readers. If some of you would like to be tagged, just leave a comment to this post and I’m going to tag you :)! That’s the portrait I have been working on this week, but now I call it finished. I can’t stand rough watercolor paper for drawing purposes. No matter whether we’re talking about graphite, charcoal, colored pencils or oilpastels. What on earth made me use it for this drawing??? Don’t know, I’m just happy that I’m almost done with it :)! 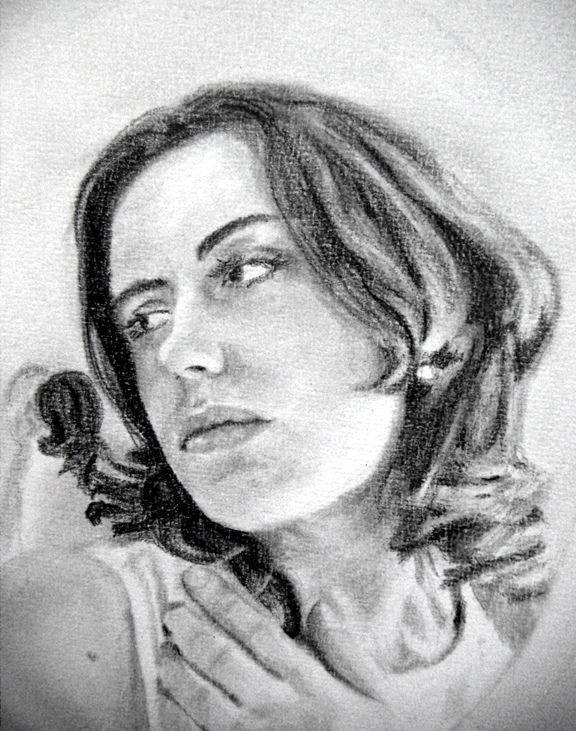 You are currently browsing the Graphite / Charcoal category at : silviasblog.com :.